You probably already know that a biography is a story about the life of a person, written by another person. 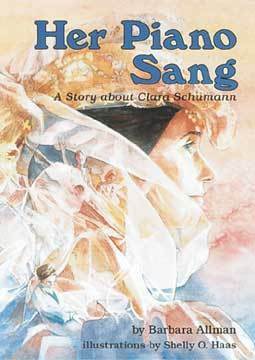 I wrote about a musical person--Clara Schumann. I guess you could call it a musical biography. Do you know what an autobiography is? Auto means self. So an autobiography is the story of a person's life written by that person. Have some fun writing a musical autobiography. You can write about anything in your life that has something to do with music. For example: Tell about your earliest musical memory. Was it hearing someone sing to you? Do you remember playing rhythm instruments at school? Maybe it was watching a marching band in a parade. Or listening to your big sister's CDs. Why do you remember it? What feelings do you have when you think of it? Do you think it changed you? In what way? Teachers! Click here for a follow-up cooking activity. Kids! Click here for some musical writing fun. Teachers! Click here for an introductory activity.